This one goes out to Doc Al, a certain proprietor of a certain watering hole. I hope you're going to turn "Story Time with Stel" into a regular -- it's such a great title. "You're not 21 - get out of the bar!" My grandmother had a cousin named "Stella". When I was young, us kids used to call her "Cousin Stel". She would babysit me when I was little and she always read stories from a big old children's story book. Story time with Cousin Stel. Hmmm. Thanks for the positive word. I think there's quite a bit of material here. I'm sure I'll try some more. Wow. That's just odd how that worked out. Maybe I was channeling. Funny. Makes me think of the scene from "Strange Brew" where Bob drinks his way out of a tanker truck & then puts out a fire. Kind of Bugs Bunnyish if you think about it. 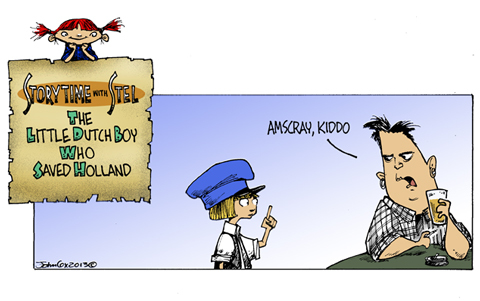 If Holland was on fire, the Dutch boy wouldn't be a hero, though. That boy has a promising future as a proctologist. Now he just need to learn to say, "Bend over, grab your ankles, turn your head and cough." A mullet would have helped me get the full effect of the joke. I spent half the day trying to figure out why the Dutch boy was trying to plug Uncle Kracker. The story of the Dutch boy plugging the leaky dike with his finger, saving the town. If you change the "i" in "dike" to the "sometimes vowel" you get a homonym that means chicks what likes chicks. That means the Dutch boy has a promising future as a groinocologist. Close, but no cigar. Well, maybe there is a cigar, but don't smoke it. This page contains a single entry from the blog posted on January 8, 2013 9:31 AM.